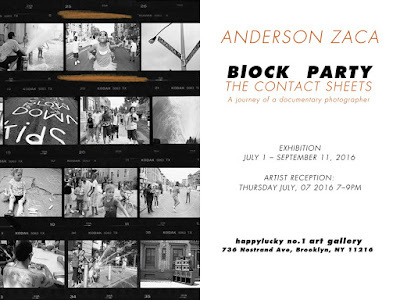 I'm stoked that my good friend Anderson Zaca called me up to be a part of the showing of his fantastic work documenting NYC block parties. Zaca, a São Paulo native, photographed hundreds of block parties in every borough from 2005 through 2012 after receiving inspiration from stepping into one for the first time in his Crown Heights neighborhood. This exhibition showcases the unseen photographs from the resulting book, Block Party: NYC Soul of Summer. Needless to say, I'll be playing NYC block party vibes. The contact sheets the visual journey of a documentary photographer from Anderson Zaca on Vimeo. Block Party, celebrating New Yorkers across race and class, sharing regional pride from different neighborhoods. Nothing says summer in New York like a block party. The streets are closed, the hot dogs are cooking, the bouncy castles are full of airborne kids, the beer is flowing, and so are the fire hydrants. To welcome summer, happylucky no.1 is showing photographs from Anderson Zaca’s series Block Party: NYC Soul of Summer. Born and raised in São Paulo, Brazil, Zaca moved to New York in 1995 and currently lives in Brooklyn. He studied photography and embarked on a career as a commercial photographer, shooting for such companies as Nike, Dooney and Bourke, Target, and Facebook. Between 2005 and 2012, he photographed hundreds of block parties throughout every borough in New York, using a 35 mm camera and an audio recorder. He captured the interaction of neighbors of all ages playing games, sharing food, dancing and playing music, playing dominos and cards, and chatting and joking on the traffic-free streets. His pictures capture the way the festivities differ from neighborhood to neighborhood. Zaca was inspired to begin the series when he stepped out of his apartment in Crown Heights some years ago into his first block party, something he’d never seen before. In 2015, Zaca published images from the series in his book Block Party: NYC Soul of the Summer, but the photographs on view at happylucky no. 1 were not included in the book and have not been previously shown.